Tilman Hausherr: "NOTS 34: criminality successfully protected by copyright law"
reproduction except in usenet and WWW is verboten cancellation is a crime (wire fraud /"computer-betrug") both in Germany and the US. Indirectly, similar questions could arise in Germany. Luckily, there is legal precedent about practicing medicine without a license. A "miracle healer" litigated the right to practice his healings, and lost in two courts. The reason for this is that only qualified people should "heal"; the idea is to make sure that even a healer in alternative medicine is able to notice when someone is really ill, to refer him to a real doctor. The court case is: OLG Münster, Az: 13 A 4973/94, mentioned in Berliner Dialog 4/97, page 31. My own qualification is that I am a software developer with law and cults as hobby; all legal opinions are just a result of my hobby, and should not be seen as legal advice. Copyright laws in Germany allows quoting for copyrighted documents, this is explained in §51. Complete publication ("öffentliche wiedergabe") of a copyrighted work would be allowed if the person publicizing it doesn't make money from it, according to §52, but the copyright holder must receive a certain amount of money. While german copyright law is unclear about how much this is for "internet publication", as amounts are explained in §54 only for pictures and sounds. Important is to mention the source (§63). Interesting is that according to §31, "unknown forms of usage" cannot be covered by a previous agreement. This means that RTC does not have rights to use LRH's works on the internet, unless RTC signs such an agreement with the copyright holder. Apparently, german laws allows a generous usage of copyrighted material: in the book about Gottfried Helnwein (an occasional non-scientologist), the author Peter Reichelt made generous usage of scientology publications (he included a complete article! ), but has never been sued. Martin Ottmann apparently posted "secret" scientology materials, but was never contacted by scientology, although he gave his address. Numerous people are believed to have died from the application of NOTS34. US Judge Ronald Whyte has prohibited Keith Henson to send this document to law enforcement, even after he was told of the deaths. This makes him a co-conspirator, but he is protected by federal immunity. Even in court, scientology attempted to prevent discussion about the material; scientology's attorney Sandy Rosen (Mr) tried to keep the material off the eyes of the Jury! Scientology claims that a segment in the court which discusses the NOTS is sealed. Nevertheless, the transcript is widely available. Scientology claims that NOTS34 is "unpublished", but the materials are available to every scientologist who pays for the course and who has done the previous courses. NOTS34 is a small part of a bigger work; there are about 50 different NOTS files, and they cannot be bought separately. Sadly, Judge Whyte considered NOTS 34 as a single work. The author of this analysis is regularly threatened by one Helena Kobrin, an attorney working for scientology whose mental sanity can be doubted. (This will be discussed in a separate analysis). This attorney has accused the author of being a criminal, and has also wasted the time of his internet provider with useless messages. Helena Kobrin has already been fined for bringing a frivolous lawsuit; this case is now taught in law school as a bad example. Boooh! Even worse, an old friend of Helena Kobrin, attorney Maureen Garde recently came forward with an internet testimony that Helena Kobrin herself was involved in a massive copyright violation when she was in Law School. These "source books" consisted of photostatic copies, frequently multiple copies, of such materials as entire published, copyrighted law review articles, large portions of copyrighted legal treatises and other books, even entire newspaper articles, as well as copies of cases from West Reporters (whose headnotes and key numbering system are copyright protected), and statutes from copyrighted sources. "Copy, copy, copy"! You might say that was our motto. If these copyright violations would go to court and be treated like the Henson violations, Helena Kobrin might be fined to millions, if not a billion dollars. In discussion of small excerpts of scientology, scientologists often claim "this is out of context". When asked for the context, they claim that scientology is much bigger, i.e. basically a critic would never get the context because he would first have to learn the "full" scientology. In this case, the full text of NOTS34 shows very well what the crime is about. While David Mayo is the author of NOTS, it was a "work for hire", i.e. Mayo was the long arm of the delusions of his criminal master, the convicted felon and tomato auditor L. Ron Hubbard. In the text below, the original text starts with ">" in the first line, and appears in another color. "NED" means "new era dianetics". It is an attempt to sell the book "Dianetics" a second time, since the old dianetics book is also still sold. "OT" means "operating thetan". When scientologist does a level known as "OT3", he believes that he is possessed by the spirits of aliens murdered 75,000,000 years ago by "Xenu." These spirits (or "space cooties") have to be exorcised, at a very high cost per alien. Celebrity scientologists like John Travolta and Tom Cruise did OT3. NOTS (= NED for OTs) is also known as "OT5". It deals with more space aliens who have not been exorcised in OT3 and 4. Of course, these files are as much confidential as scientology's PC folders are confidential: not at all. A few years ago, three pranksters were able to get a pack of NOTS simply by visiting an org and wearing a fake naval uniform. As we see, this is about healing. A "physical condition" is an illness, and not something spiritual. There is a definite sequence for handling a physical condition. Note that he says "definite sequence". He clearly alleges that it can be done, and that there is a way so it can be done, and he describes the way. It is not suggested to go to a doctor. It is not explained that maybe this would handle only psycho-somatic illnesses. an irritant. Or "poison", "bad food", "paint fumes", etc. "BT clusters" are groups of space aliens. A part of the bait-and-switch of scientology is that they are never all handled. L. Ron Hubbard claims that these space aliens are poisoning our body - maybe by impersonating chemicals. Scary: L. Ron Hubbard considers all illnesses to be the result of body thetans. But himself he didn't mind to be put on "Vistaril" or other drugs. L. Ron Hubbard was obviously afraid to eat his own spiritual sausage, like the Phillipino "psychic surgeons" who sent their families to real hospitals. This is kiddie stuff. The scientologist is asked to impersonate what is bothering him. It is a sad example of the low skills they have. No explanation is given how to "resist". A scientologist won't be able to ask - this would be "verbal tech". The item will then cease to read. "read" means that it will stop appearing on the e-meter. The body part affected by the item. E.g. for the item "dust"
Now the scientologist is asked to impersonate his body parts. If incorrectly applied, a scientologist would end as his own feces. and clusters are handled, the body part will no longer read. The next action is to handle illnesses of the body part (i.e. or disease or the body part.) "Illness of body part" will cease to read. For example because of smoking too much. 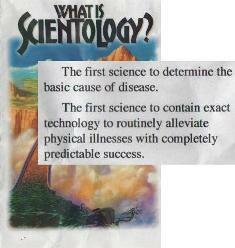 Here, the scientologist is asked to "be" an illness. "I am a headache". Again - the e-meter tells whether you are ill or not. the body part. Handle all such BTs and clusters by blowing them off. "Cures for Illness" will then cease to read. You have to "blow" all over your body, in the hope of getting rid of the space cooties. illness. Blow all these off and "Protest of cures for the Illness"
Aha, some of the space aliens don't want to be healed, so you have to stop their resistance by filing a "protest" (or maybe a lawsuit?). part, until they're all handled and the body part just F/Ns. This is again the previous steps 1 - 5, an attempt to make the document longer. Clear, and thought they had engrams on it when they didn't. What is that? A BT who went "clear"? Did Xenu already have "clears"? I thought John McMasters was the first clear. But this claims that BTs went clear 75,000,000 years ago, on the days where Xenu ruled the Galactic Federation. the period of illness which they experienced. L. Ron Hubbard implicates that illnesses produce BTs, but also that BTs produce illnesses! recur. So all steps must be fully done in that sequence. L. Ron Hubbard alleges again that this is the way to heal. At no time he says that you have to believe, pray, or whatever. He clearly says that "this is the way to do it", and if you don't do it that way, you won't be healed. Even a medical doctor would agree that his own science does not work 100%. Technique is the most usual and effective method. "Valences" are multiple personalities of scientologists. Here the reader could easily get confused: the OT becomes a "pre-OT". This is because the levels below OT8 are actually just "pre-OT" levels. not fully handled resulting in the item being suppressed or invalidated. This explains that if you are still ill, you are to blame. No need to visit a doctor - it's your fault. Indeed, he repeats himself. But that's what scientology is all about. According to Diane Richardson, a medical librarian, NOTS34 is very similar to "visualized imagery", which is promoted by "alternative medicine" advocates. Cancer patients, for example, are taught to visualize their white blood cells as white knights in shining armor, riding out to do battle with the evil black-dragon cancer cells. They're taught to visualize their affected organs and then imagine them all healed and healthy again. I agree with this opinion; the key word is "being the item". At best, this therapy makes an existing therapy stronger (because you "believe", "have hope"), but at worst, it prevents you from seeking an actual therapy. I left this NOTS34 intact so that people can see that at no time, L. Ron Hubbard tells that a conventional method should be used first to find whether there is a physical illness. Also, this way I can avoid that scientologists will claim that it was "out of context". This NOTS 34 can explain why Heber Jentzsch didn't prevent his wife Yvonne dying of a brain tumor, or why Flo Barnett was so desperate that she killed herself although she could have lived if she had continued with conventional medicine. It makes me sad that so many people have died and will die because they believe this fraud, and that the Honorable Judge Whyte is responsible for this. 22 BUT I ASK YOU TO REMEMBER THAT TESTIMONY. 17 PHYSICAL CONDITION, USED THREE TIMES. 23 WHO COULD HAVE DONE SO. Sadly, the jury did not agree, and slapped a $75000 fine on Henson. «Ted Cormier, a personal friend of mine. He had Parkinson's disease. He was ordered to leave Gilman Hotsprings and go directly to Flag for NOTS 34, auditing to cure his cancer. When this failed, Ray Mithoff sent him orders in his Pre-Clear folder for him to "end cycle." He died.» — Jesse Prince. "Affidavit of Jesse Prince (20 August 1999)"
Apparently, they didn't like his flippant attitude in court. I have observed that this work has been cancelled several times, and also "nuked" from http://groups.google.com. However Scientology's attorneys never contacted me, although they know my street address from a previous lawsuit. Further reading: "Practicing medicine without a license?"